I lived in Japan from 2001-2002, working in Saitama prefecture, Hidaka City as an Assistant English Teacher on the Japan Exchange and Teaching (JET) Program. Although I was only in the country for one year, my year in Japan was one of the most influential of my life. I cannot imagine a better way to spend the first year out of college, and I’d recommend it to anyone who is interested in living abroad and experiencing a unique adventure. I’ve been quite preoccupied by the news from Japan since the March 11 earthquake, the tsunami that followed, and now the frightening nuclear crisis. I’m hoping for the best. I’ve been in contact with my friends in Tokyo; fortunately everyone I know in Japan (and their families) are safe. My heart goes out to the victims and their families. I can’t imagine the devastation that has come crashing down on these people. I’ve been thinking a lot about the Japanese earthquake and how it has reminded me of certain aspects of Japan that I really admired. Crises amplifies the strengths and weaknesses of every individual/organization/culture. Japan is prone to earthquakes. When I lived there, I would occasionally be awoken in the night by the sound of teacups rattling in the cupboards – the walls of my apartment building would wobble. Most of the time the shaking only lasted a few seconds, but it still was unsettling to a guy from the Midwestern U.S., where earthquakes almost never happen. I remember reading about the Tokyo earthquake of 1923, where over 100,000 people died. Japan had a terrible earthquake in Kobe in 1995 where over 8,000 people died. Even with all the modern building codes and advanced construction techniques of a wealthy country like Japan, there’s only so much that can be done to protect human lives against the worst earthquakes. So in a way, despite the terrible loss of life, part of me was surprised that the Japan earthquake and tsunami haven’t been even more deadly. 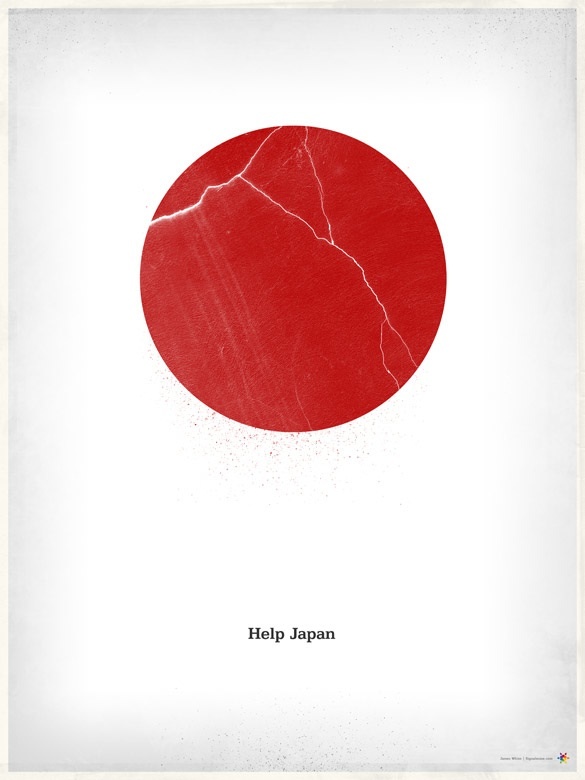 I know, Japan is a wealthy country – but they still could use our help. I donated to the American Red Cross Japan earthquake relief fund (any unused proceeds will be used to help with other disaster relief efforts around the world). Every dollar counts. If you’ve read this far, will you consider making a small donation? At times like these, we should all feel lucky just to be alive, to have family and friends who love us, to have food in our bellies and money in our pockets. Let’s give a little bit to help people who are facing terrible challenges – in Japan or elsewhere in the world. 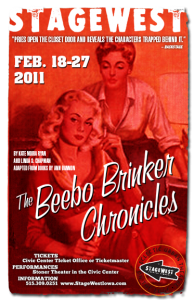 I am part of the cast of “The Beebo Brinker Chronicles,” a play being produced by StageWest Theatre Company in Des Moines, Iowa. Opening night is February 18, 2011. I’ve been thinking off and on about trying out for another play during the past few years, but I never got around to it. Finally last November I decided to audition for “Beebo Brinker Chronicles,” and I got a part! I was thinking about some of the things I missed about acting, and why acting is important. Live Connection with the Audience: I love live theatre because it’s a high-wire act – there’s an element of risk and uncertainty, each show is its own singular event that will never be exactly duplicated, each line reading is a chance to make people laugh, make them think, make them feel surprise, sadness, or shock. Theatre is a communal experience. The audience is taken along for a shared voyage of discovery. The audience co-creates the experience along with the performers – it’s a subtle interplay of energies. There’s nothing quite like it. Exploring the Human Experience: Theatre is one of the world’s oldest art forms, dating back to 2,500 B.C.E. As a History major, I love how theatre can help us to revive the past, make it real, honor the lives of the ones who have gone before. Acting helps us to imagine other lives and other ways of being. What lessons would people from those earlier years want to impart to us? What are the best aspects of each era of human existence that we have in common? Collaboration: As a freelancer, I spend a lot of time working alone – so it’s good for me to be part of a team of actors, working on a common creative endeavor. I learn a lot from my fellow actors, watching them, listening to them, interacting onstage and offstage. Every play is a unique coming-together of a diverse group of talent. We spend many hours together, we explore some intense emotions together, sometimes we yell, cry or kiss (depending on the script). Self-discovery: Every character I’ve played over the years has taught me a little something about myself. It’s fun to see how others see me when I’m portraying a character. Every role, every line, has complexity and nuance and offers me a chance to imprint something essential of myself. Acclaim: I love acting because, frankly, it feeds my ego. There is such a rush that comes from performing for an audience. I love the sound of a room full of people laughing, the air of expectation on opening night, the roar of the crowd at the curtain call. Where else in life do you get to feel this way? Tickets are on sale now for “The Beebo Brinker Chronicles” at the Des Moines Civic Center’s Stoner Theater! One of the most rewarding aspects of being a freelance writer is building relationships with clients. Probably 95% of my clients have been good to work with. There have been a few that weren’t the best fit for me, or something wasn’t right with the project. But for the most part, I’ve been fortunate to work for some really great clients. What makes a great freelance client? Great clients like your work. If you find yourself encountering clients who are constantly dissatisfied or asking for significant revisions, maybe you’re not on the same page with the expectations of the project – or maybe the client isn’t the best fit for the kind of work you do. The best client relationships have a level of mutual understanding and an ability to anticipate needs – you can predict what the client is going to want for a certain project, and the client trusts you enough to let you work independently. Great clients pay their bills on time. Freelancers depend on multiple clients to pay their bills promptly – instead of one steady paycheck, we rely on many smaller paychecks from different sources. The best clients will pay their bills on time and without making you jump through too many hoops – if you’re constantly having to call and serve as your own collection agency, that might be a sign that it’s time to cut ties with a client. Great clients trust you. Some of the best clients I’ve ever worked with are the ones that invest their trust in me – they want my help to build their businesses and deliver great results, and they’re willing to work closely with me and confide in me to help convey the full scope of what they want to accomplish. It’s better to be a trusted advisor than a “hired hand.” Great clients will share their ideas, hopes and dreams for their businesses – rather than holding you at arms-length. Great clients pay you what you’re worth. It always amuses me when I’m talking to a new prospective client, and before we’ve even discussed the project, they immediately ask me to discount my rates. (I once had a prospective client call me to ask if I would work for $15 an hour – the answer is “No.”) Do these people do this to other professional service providers like mechanics, accountants or orthodontists – “Uh yeah, I need to get my car fixed – can you do it for $5 an hour?” Clients that try to undercut your pricing or that act suspicious/incredulous about how much you charge aren’t worth the trouble – they’re not used to hiring professionals and paying professional rates. There are always going to be bargain-hunters and tire-kickers out there. Let them go, and instead focus your energies on clients who understand and appreciate the value you provide. Read the job description (the whole thing). I’ve hired people on Elance myself, and it’s always immediately apparent which ones have actually read the entire job description (and put some thought into how to respond) and which ones are just sending out mass-produced auto-replies and copy-and-pasted responses. Be sincere: Employers respond well to people who sincerely care about the project. Show that you took the time to read the description and that you’ve put some thought into how you want to approach the project. Write a 100% original response to each and every job that you bid on. Be human – be “real.” Show some enthusiasm and emotional connection to the project – explain why it is interesting to you and why you want to work on it. Be forthright: If there is part of the job description that you don’t totally fulfill, say so – but emphasize instead the skills and experience that you are most confident about. Get your pricing right: Don’t underprice yourself. 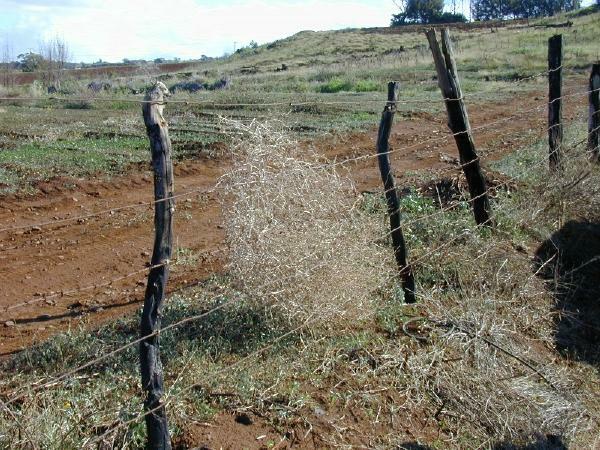 You don’t want to be the lowest price bid for an Elance job. Make a reasonable estimate of how long it will take you to do the work. Setting rates can be complicated, but you should plan to make – on an hourly basis – at least three times your equivalent hourly earnings at a full-time job. (If you make $30,000 a year at your day job, your hourly rate is $15 – so your freelance rate should be at least $45 an hour.) Don’t sell yourself short. Don’t try to compete on price – instead, compete by showing how you can create value for the client and demonstrating why you are the right fit for the project. Follow up: If you don’t hear back from a client right away, feel free to follow up with an e-mail on the Private Message Board (PMB). But don’t just “ping” them with requests for replies – always try to add some new information with every time you contact the client. For example, say: “I’ve been thinking about your project and I had some ideas that I want to share with you,” or “I don’t think I mentioned this in my project bid, but I also have experience in (OTHER SKILLS)” or “Here are some samples from a similar project that I recently completed.” It pays to be persistent – not annoying, not “spammy,” but just check in with the client and let them know that you’re interested and that you are thinking about how you can help them. The first project is the hardest to win – but every project can lead to others. If you’re a new provider, it can be hard to stand out from the crowd. It might feel overwhelming, like there are dozens of people competing against you and they’re all willing to work for less. Be prepared to persevere through some frustrations and disappointments – you might have jobs that seem really promising that turn out to be awarded to someone else, or clients who seem interested to talk with you but then disappear forever. Just keep at it, stay positive, and keep bidding on jobs. Every single project has the potential to lead to many others – every project gives you a story to tell to the next client. This is the video that I made for the Elance Cloud Commute YouTube contest. Someday it won’t be called “outsourcing” or “online freelancing.” It will just be called “work.” No commute (or cubicle) required. Toggl: Toggl is a free, fantastic time tracking tool. Anyone who’s in the billable hour business (or who wants an easy way to keep track of how they’re spending their work time) should use this. It’s fast, it’s easy, it’s seamless. And if you pay $5 a month, you can access advanced features like hourly billable rates, total billable amounts, and others. Remember the Milk: The ultimate “to do” list. Track everything that you need to accomplish, and when, in an easy-to-update format. Google Voice: I finally got a Google Voice number to use for my business. I should have done this ages ago. Now people can call me on my computer instead of my less-reliable cell phone, and I can also place calls from my computer, just like a land line. The call quality has been superb. There are many other nifty features – it converts voice mail to text, it can be used to ring multiple phones, and much more. Skype: Talk for free with anyone, anywhere in the world. One drawback is that the quality of the calls is not always ideal – occasional dropped calls, sometimes the voice quality is patchy. But you get what you pay for, right? Freelancing has a lot of ups and downs. But for the most part, the highs are higher than a typical day job, and the lows aren’t quite as low. What do I love most about freelancing? The freedom. It’s a totally different way of life. It’s a totally different approach to each day. Instead of getting up too early to go somewhere you don’t want to go and do things you don’t want to do, you can structure each day as you see fit. You can take a break when you want. You can go to a long lunch with a friend or your child’s doctor appointment without asking permission. You can pursue new opportunities or ideas to build your business and chart your own course. I’m still not completely used to this – it’s amazing. Winning new business. Such a rush! Every time I win a new freelance project I feel like an NBA draft pick. I love the thrill of the chase, building new relationships, proving myself to new clients, learning about new businesses and new subjects. Repeat business. Getting repeat business from loyal clients is like having the wind at your back. I already know the client, we already trust each other, I already know the requirements and particular details that are important to them. Being “almost” too busy. I love having a full slate of work. I love looking at the clock and realizing that the day has flown by and I don’t know quite how I’m going to manage to get everything done. Helping people. I enjoy just the basic act of helping someone get something done. People hire freelancers and consultants when they have a project that they can’t get done by themselves, or when they need some fresh thinking or outside perspective, or when they need someone else’s skills that will free them up to work on what they do best. I enjoy doing my part to make a difference on each project. Making money. Being self-employed is so rewarding because you really see the link between effort and results – if you work extra hours on the weekend, you get more money. If you’re smart about managing your time and you’re productive all week, you can take an extra half-day off on Friday. It’s fun when projects go smoothly and clients are happy and bills are getting paid on time, and all of a sudden you see the money start piling up. All while having fun and having full control over how you spend your day. 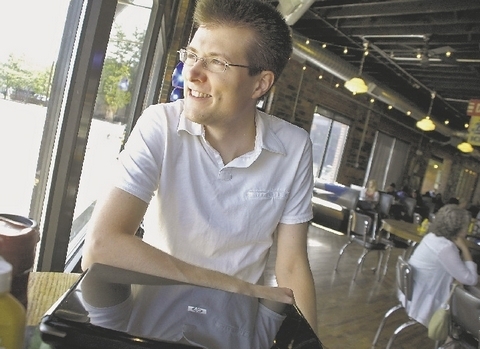 Thanks to Brianne Sanchez for a great article, and Eric Rowley for a great photo! It’s so nice to be able to work at a coffee shop in a sunny spot by the window – I’m still not totally used to that.